It’s hardly a difficult one to work out, but whoever first decided to play on the name of Kent fast bowler David Sayer and give him the soubriquet Slayer certainly produced one of the great cricketing nicknames. Amongst English pace bowlers, and Sayer was genuinely quick, it is right up there with The Typhoon and Fiery Fred. 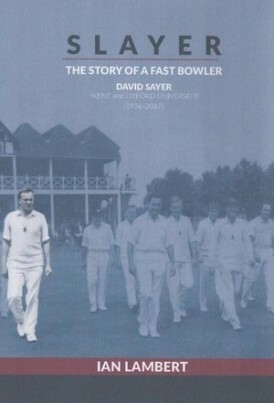 I recognised Sayer’s name as soon as I learned that a book about him had appeared, but of the man himself my knowledge did not stretch much beyond that he had played for Kent and was an opening bowler. Looking him up before Slayer dropped through my letterbox told me that in a curious looking career Sayer played twice for Kent as an 18 year old in 1955, took two expensive wickets and after a single wicketless appearance for the second eleven the following year to all intents and purposes disappeared before, in 1958, roaring back to take 89 First Class wickets at the remarkably low cost of 13.55 runs each. What happened in the intervening two years and why doesn’t his name appear anywhere in that time was therefore the first question I hoped Slayer would answer. In fact the explanation proves to be a mundane one, and my not immediately knowing the answer betrays my age, and in a positive way because it demonstrates my relative youth. The simple reality is that the reason Cricket Archive records all but nothing of Sayer in 1956 and 1957 is because he was doing his National Service in the RAF, and spent almost the whole time in Germany. His time with the RAF over between 1958 and 1960 Sayer divided his cricket between Kent and Oxford University and, following his graduation, continued to play County cricket until 1968 when he retired. After that he helped out once during an injury crisis in 1976, but that apart it was club cricket and establishing the insurance brokerage that became his career outside the game. The raw numbers of Sayer’s time in the game are impressive. His career bowling average is 23.48 and it is clear that he came close to selection for the 1959/60 England party that toured the Caribbean. Despite that, and the impressive record, it was still a little surprising to see a book about Sayer appear. After reading Slayer however the reason for the book becomes clear. Author and self-publisher Ian Lambert and Sayer knew each other as schoolboys, and their friendship became such that Sayer was best man at Lambert’s wedding. They shared a passion for cricket as well as remaining close so the death of his old friend in 2017 at the age of 80 must have been a blow to Lambert. I dare say he found writing Slayer cathartic, and his motivation for writing the book is an admirable one, that being to use the proceeds to provide a lasting memorial to his old friend. In fact Slayer is not really a biography as such, although it does follow a chronological path through Sayer’s life. It is more in the nature of a collection of stories on common themes, Lambert acknowledging in his introduction that one of his main pieces of research material being a family scrapbooks. There were plenty of other sources however, and it was a particular pleasure to see some of the always entertaining writings of David Green being quoted. An affectionate foreword is provided by former Kent teammate John Shepherd, and the friendship between author and subject informs a good deal of the book’s content as well. As with a number of self-published books the design and presentation of the content have a few eccentric touches, and I am sure the author will have been a little disappointed with the quality of the reproduction of a few of the photographs. That said the book is a profusely illustrated one that contains many images of Sayer and his contemporaries as well as by a number of interesting pieces of memorabilia from that scrapbook. At the end of the day however all books must be judged on whether or not they are worth the time it takes to go through them, and I did enjoy Slayer. It is an interesting and entertaining read about a fine cricketer and thoroughly decent man whose name deserves to be known by all cricket lovers in the Garden of England, and plenty more beyond the ranks of the Men of Kent and Kentish Men. For those wishing to purchase Slayer the email address of the author is lambertsontour@gmail.com. The cost is £10 plus postage and packing which, within the UK, is a further £2.